HOLLYWOOD—When filmmaker Ridley Scott was making the sword-and-sandal epic “Gladiator,” production came to a halt when one of the film’s stars—the late, great Oliver Reed—died before completing his scenes. Through practical and digital effects, the scenes were finished and the epic film went on to earn five Academy Awards in 2001, including Best Picture, as well as considerable box office success ($457 million). Scott (whose credits include “Alien,” “Blade Runner” and “The Martian”), once again faced another filmmaking crisis not long ago on his completed historic drama “All the Money in the World,” which recounted the events of the 1973 kidnapping of billionaire J. Paul Getty’s grandson and namesake, J. Paul Getty III. Having made his fortune in oil, the elder Getty was regarded as the richest man in the world at the time, and yet he hesitated to pay the relatively small ransom ($17 million) from Italian gangsters for the return of his teenage scion. He finally reconsidered after the kidnappers cut off and mailed the boy’s ear, but the entire episode took place over a tense five-month standoff. Oscar winner Keven Spacey (“American Beauty,” “House of Cards”) was cast in the role as the notoriously tightwad tycoon but when allegations of sexual misconduct against him surfaced this fall, the decision was made to recast the part and reshoot scenes, even though the film was complete. With the producers’ blessing, Scott met with Oscar winner Christopher Plummer (“The Sound of Music,” “Beginners”) just weeks ago and scrambled to reshoot the scenes with Plummer as Getty, and re-edit the film as quickly as possible. Somehow, the efficient and experienced Scott, who apparently thrives on an emotion he calls “positive stress,” managed to turn what could have been a costly disaster into a golden opportunity to re-do his film, and deliver it on time for awards-consideration. 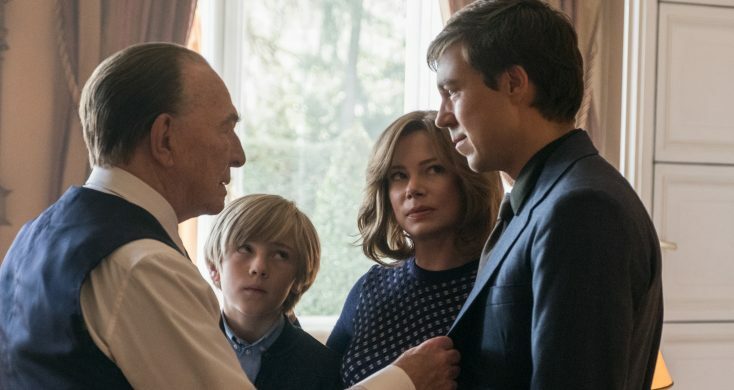 “All the Money in the World” already has earned three Golden Globe nominations: for Plummer as Getty, co-star Michelle Williams (“Brokeback Mountain, “My Week with Marilyn”), as Getty’s estranged daughter-in-law, Gail Harris and for Scott’s direction. 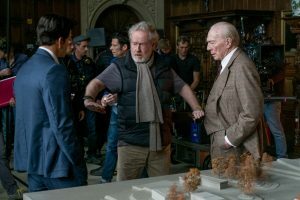 At 80, the tireless filmmaker, who has earned a knighthood in his native England for his incredible filmography, shrugs off any suggestion that his success in distancing the film from the Spacey scandal, was in any way remarkable. It apparently only took the self-proclaimed “economical” filmmaker nine days to do the reshoots, which appear seamlessly within the film, which also stars Mark Wahlberg as Getty’s right-hand-man Fletcher Chace, and Charlie Plummer (no relation to Christopher Plummer), as Getty III. “Ridley eats stress for breakfast,” the film’s producer Bradley Thomas says, echoing a recent comment made about the film’s unflappable director. At a press conference, Scott and 88-year-old Plummer spoke about their working relationship and their remarkable filmmaking feat. Q: What was the first phone call between you after it was decided to reshoot the film? Scott: We met in a conference room in the Four Seasons in New York. I didn’t want to meet in the bar because I’d just flown in from London. Plummer: He flew all the way from London to see me. Even if he didn’t want to see me, I would have done it. Scott: Christopher said, “It sounds good. Let me read it first.” So, the next day, we said, “Yes, why not?” He’s such a pro. He gets it. If I’m going to fly all that way to see Christopher, it’s something serious. Q: Christopher, was it an instant “yes” for you? Plummer: Yes, for years I wanted to work with Ridley, and I’m not just saying that so I can get another job. Seriously, I’ve admired his work tremendously. I would have done it even if I loathed the script. I must congratulate the writer (David Scarpa, “The Last Castle”). I really relied on him because I hadn’t any preparation at all. Ridley’s job seemed to be to make me feel as confident and comfortable as possible, which he did miraculously, mostly because of his outrageous sense of humor. That would calm anybody down. David’s wonderful script, which I relied on heavily having no pretense at research. There were so many lovely colors within the character. It’s wasn’t a monotonous monologue of page after page. There was an awful lot of value in it. Scott: It’s worth mentioning, this happened about 3-1/2 weeks ago. We went to Rome and here we are. I think Chris did very well in that time—from zero to Golden Globe (nomination). Q: You got the film shown to the foreign film critics just four days after wrapping production. Would you ever want to have that kind of pressure again? Scott: Stress, for me, is not working. I never consider that I’ve worked a day in my life. My job is not work. My job is my passion in life. So, I don’t even think about it. Q: Usually, with films, you don’t have a chance to do a do-over. Having this opportunity to go back and reshoot some scenes, were there some significant differences? Did you change angles or dialogue? Scott: No. First of all, you have to protect Christopher from seeing what Kevin (Spacey) did because it has to be his. Christopher has to own it. I asked him if he wanted to see (Spacey’s scenes) and he said, “Absolutely not.” So, that was the right thing to do. Off that, I was born with a natural geometry in my head. It’s a gift for me having done years of (shooting) commercials. I can literally shoot anything from any angle. Normally what lands—I hate to say—is “perfect,” but rather “correct.” It’s right, and I wouldn’t re-do it. I can turn a nine-day shoot into a 22-day shoot, if I’m being inefficient. But, I figured with this, all the scenes worked geographically and choreographically so well, why change that plan? I never discussed that with Chris; I protected him from that. I just wanted to slide in what we already had to minimize the extent of what we’d have to do. So, it was partly driven by practicality but also mainly driven by the fact that I liked the scenes. Q: Did doing this movie give you insight into why rich people like Getty value money over their loved ones? Scott: There’s a scene with Getty cleaning his gun, and we get inside his soul and his disappointment. He knows what money can do. It destroys men. It destroys families. But most of all, it destroys the children. He talks about the abyss of wealth, which is also the abyss of poverty. I’d much rather die in the back of a Rolls-Royce than in the back of a garbage can but when you’re approaching that point, it’s all the same. You’re in so much disarray and distortion that either one is a tragedy. Q: What is the pleasure you get from storytelling? Scott: It’s the challenge. Once I start a new film, my job is a minute-by-minute process of things changing all the time and the ground shifting under your feet. Sometimes it’s important and sometimes it’s par for the course. I like it. That feeds my stress. There’s positive stress and negative stress. Negative stress is doing nothing. That’s the worst stress you could possibly feel. Feeling unemployed is the worst possible experience. Feeling over-employed is what I call positive stress. Going forward into the unknown after reading great material is positive. Sometimes you start without a great script and you’re rewriting on the first day. That’s a nightmare. So, it’s important to get good writers and have it on paper first. Once you have it on paper, you have the emotional blueprint of what you’re about to do. That’s when you turn it to magic, hopefully. Q: Christopher, was the time constraint a source of stress for you? Plummer: You thrive on it. If you love your profession, which Ridley obviously does and I certainly do, you welcome challenges and stress more than anything else. Why do (actors) wait to play King Lear? Because there’s nothing like it written before. It’s not because we think we’re going to be marvelous in it—well, that’s a lie—but that we’re going to feed ourselves with the hungry, searching feelings that we have in this profession. Q: Ridley, what was it like working with Christopher and the other actors re-filming those scenes? Scott: I came into directing without going through drama or film school. I was a good designer. I was thrown in the deep end by being asked to direct live TV. I only had three weeks to prepare. The best thing to do is create a partnership with the actor. My job is to be their best friend and make them secure for them. And that’s what I did with Christopher. Q: Ridley, what’s the plus and minuses of making a film inspired by true events compared with making an entirely fictionalized story? Scott: Whatever you do, you have to be true to your story, whether it’s fiction or fact. The great thing about fiction is if it feels like fact, it’s stronger, and if its fact and feels like fact, it’s kind of dangerous. You’ve got to be able to communicate (regardless). Q: Is it a hassle with the studio when you do a period piece like this, in terms of budget? Scott: I did a film called “American Gangster,” in Harlem, which was set in about the same period as this. It was a fairly restricted budget. This one was a slightly more expensive movie. It wasn’t a low-budget movie but it was much lower than (reported figure of) $60 million. Of that, I’m respectful for what (the producers) want to do. I’m very economical. I always end up slightly below budget. It becomes an internal competition for me. I minimize everything. Do I need 100 (period) cars? No. Do I need 10 (period) cars? Yes. Did I need to go crazy on wardrobe? No. You have to know where to (put the budget) to make it count.